We noticed a piteous, mewling noise recently. It was coming from a part of the blogosphere we seldom visit—the drafty, empty rooms of “The Moment” at the New York Times website. I hope you will soon review more fragrances :o) Thanks. Hey, is this blog on hiatus? I’m looking forward to more reviews! Such sad Mouseketeers (Anette! Pedro! Michael!). Could it already be the end of the show? (“Now it’s time to say goodbye to all our company . . .”) We decided to look around a bit more. On September 4, Sandra Ballentine wrote about the new Daphne Guinness fragrance. Her commenters weren’t interested. Where’s Scent Notes by Chandler Burr? He doesn’t seem to have published a review in over a month. Seconded! I miss Chandler! Is he on an extended vacation, or is Scent Notes no more? Where is Chandler Burr? I miss Scent Notes. Is this feature gone for good? I’ve got to assume that Chandler Burr is no longer writing Scent Notes for NY Times. He has been AWOL for two months now. Yes, where is Chandler? Anyone know? I miss his Scent Notes column. Chandler Burr’s writing was the best thing about T magazine. Did his reviews offend the perfume companies or what? Call the Trend Desk! It’s a veritable chorus of lamentation. Inhales the void? Sweet Jesus! Has he been sucking on the tailpipe of Aunt Mabel’s Gran Torino? Thought we took the battery out of that fucker. recession . . . emptiness . . . absence of people . . . fragrance sales have fallen . . . my investment statements [. . .] convey the smell of nothing . . . everyone is depressed . . . we’re edging into the olfactory void again . . .
Could this be his valedictory to perfume reviewing? I went on a hiatus . . . The blog column should be coming back when I stop drowning in stuff. Again with the imagery! You’re making everyone in the clubhouse very nervous. Jean-Claude Ellena's publicist just passed out. Frédéric Malle is even more, how you say, triste than usual. Plus the First Nerve technical staff is getting a little twitchy. Their livelihood depends on the BurrOmeter. We sank a lot of capital into a top-of-the-line model and only used it twice. Going to have a hard time justifying that expense at the next board of directors meeting. Maybe Chandler was off having plastic surgery, since he now looks just like Luca Turin in that "have you seen me?" photo. Try to keep up, will you? The smart money in Canada believes they're the same person. But I do like your attention to detail and your mildly paranoid conspiratorial bent. There may be a spot for you at the FirstNerve news desk if we have to lay off the BurrOmeter techs. Mousketeer Katie has been dolorously singing "C-H-A...N-D-L...E-R-B-U-R(R)..." for months, mourning the absence of Chaz and his lavender flights of fancy. I even started clapping to show that I believed in him, hoping that like Tinkerbell, he would return to our world. Nothing yet. Who will join me in clapping Chandler back to life? But I swear I saw him wearing glasses and a yellow sweater! Ups, sorry Chan...Was I supposed to tell these folks where you are hidding??? The BurrOmeter technicians are clapping like madmen. They believe. They really really do! Wow, he gets around. He's also been spotted in a semi-coherent ramble on Tina Brown's Daily Beast. I think the start of his absence on The Moment coincided with the release of his novel; the release of his novel coincided with a book promotion tour; the book promotion tour coincided with a number of very bad reviews; a number of very bad reviews then coincided with the the book promotion tour drawn to a hasty close -- so maybe he just needed to take a little bit of time off to smell that great big void in private? Have you no pity? Monster! I'm sure Chandler has his reasons. Maybe after all of those reviews of latest fragrances his brain has been pickled in dihydro myrcenol and he's just gone fishing. 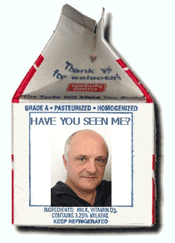 is that luca turin on the milk carton? love the image. Not that Mr. Burr needs any help from me, but I would like to point out that his novel, "You or Someone Like You", got universal praise in all the places that matter (and in many of those that don't): a starred review in Kirkus (the toughest of all), Publisher's Weekly, NPR, Washington Post, Wall St. Journal. And no first-time novelists are afforded promotion tours anymore. As the author of a memoir, I can appreciate how difficult it is to toil for donkey's years on a book, have it be critically well-received, and then have it contend with all the other pop culture flotsam for its own tiny place in the sun. It's tough out there in the book stacks, kids! Mind you, I've not read Burr's book myself. Too much other flotsam clamoring for my attention! I think he has surfaced at gq. he had an earlier feature with them in the spring and another piece is in their novemeber issue with even more reviews on their website.